Moles, Rabbits and Foxes can cause untold damage to gardens, lawns, commercial properties, farms and greenery. Their tunnelling and burrows damages the integrity of the ground, potentially creating hazards for people and animals, as well as making areas look unsightly and unpleasant. 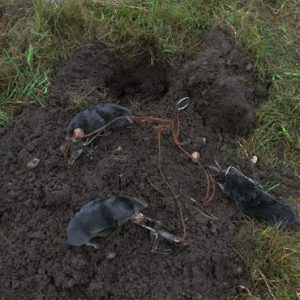 Twilight Pest Control provides very effective and affordable mammal control programmes across the Derbyshire and Staffordshire area, treating Moles, Rabbits and Foxes. Why you need to control some mammals like Moles, Rabbits and Foxes? Moles, Rabbits and Foxes can cause untold damage to gardens, lawns, commercial properties, farms and greenery. They can all be real nuisance pests, not only because of the damage they can cause with their tunnelling and burrows affecting the integrity of the ground, potentially creating hazards for people and animals, but also because of the serious public health risk some can cause due to their ability to spread disease. These pest mammals can also make nice greenery and gardens look unsightly, or in the case of Foxes they can cause unbelievable damage and mess around livestock and poultry. Twilight Pest Control staff are all fully trained in the latest techniques and products, and will use where possible a variety of control methods to solve your problem. Generally with most mammals issues, effective use of traps by an skilled operative is the most appropriate control methods. However sometimes other methods and proofing may also be required. Cliff at Twilight Pest Control has decades of experience with trapping various mammal such as moles, rabbits and foxes. So you can be assured by contacting Twilight Pest Control that you’ll be getting the best job done.